Do you know of a vegetarian? Here is what you can do to help them! We have to start slow with approaching this disease. Start by ordering a burger from Montana Jacks in front of them and then eat it. Make noises like “mmm” and lick your lips. Exclaim “this is the best food, it gives me vitality!” Sometimes, those who freshly contracted the disease will snap out of it and order one alongside you, a small victory. Invite them to our Billings restaurant and get there earlier than planned. Pay no notice of their condition and “accidentally” order them a steak. When they arrive, explain to them that you were early and you did them the service of ordering. Because quality steaks are pricey, say that you’ll take care of the bill. Watch them sweat. 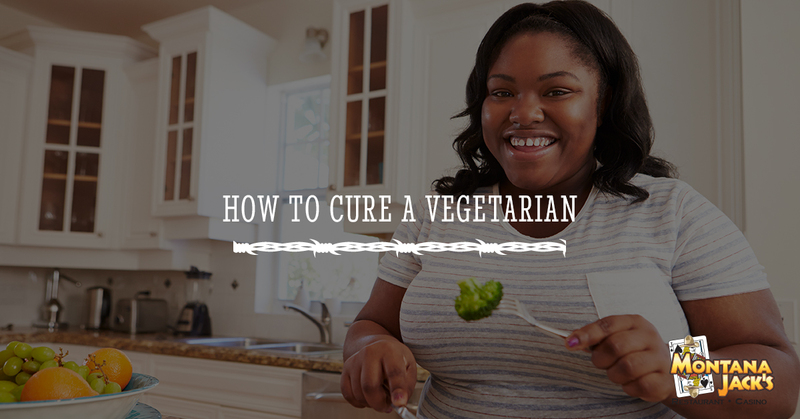 Either they’ll give in and consume the streak, which is the only proven way to treat vegetarianism, or they’ll uncomfortably reveal their illness, something that may or may not help. If the prior two attempts were futile, it’s time to bring out the big guns. While subliminal advertising is somewhat illegal, we’re desperate to bring our friends back to good health. Show them a slideshow of kittens playing with puppies and slip in a picture of a burger for a millisecond or play them a song with some of the words replaced with “chicken” and “beef.” This could work, but there are no promises. This is highly unethical and a last chance resort, but if it’s been years since this person has been healthy, then it’s necessary that you slip them some meat. Say that it’s “toe-foo,” whatever that is. Chances are, the color will come back to their face and they’ll become stronger within minutes of taking a bite into the food. They might be angry at first, but once they realize what they’ve been missing out on, they’ll forgive you. Sometimes, vegetarians like being sick. They say that it’s for the environment and the animals, and it’s hard to argue with that. Luckily, Montana Jacks has a ton of menu items that veggies can still happily indulge in. Whether you’re an omnivore or an herbivore, we welcome you into our restaurant located in Billings and Missoula. Hungry? Don’t drive too fast and we’ll see you soon!